The two hole cup is a great beginner toy and the one hole cup is the next step up in difficulty. 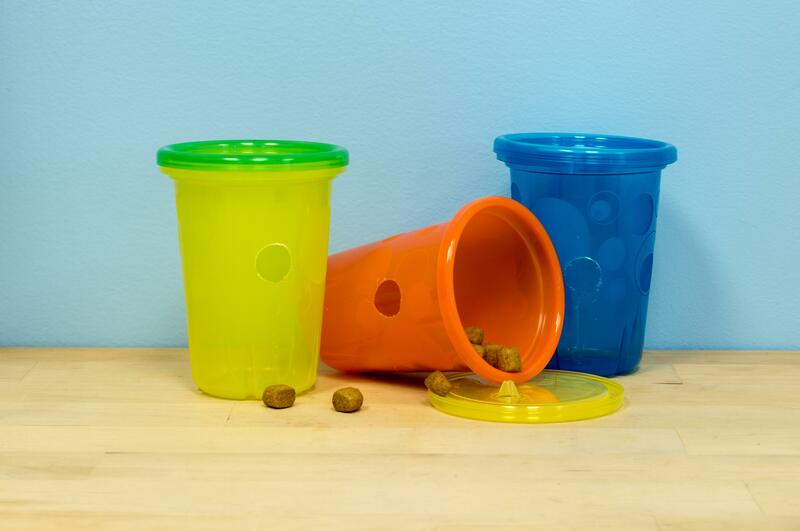 Because these toys are clear the cat can see, smell and hear the kibble rattling around inside the cup. For the master forager, fill a large foraging egg and place inside the cup for an increased challenge. Some cats really do get that skilled at foraging! Some cats "nose" food puzzles while others use their paws to manipulate the toy. Here Soren is nosing the toy. Notice how he is only able to acquire one piece of food at a time. This limits the amount of food most cats would eat in one sitting which is why foraging can be useful to achieve weight loss in some cats.